My current main occupation is running The Organic Gardener's Pantry in Victoria, B.C., which I took over from Phil Nauta, a friend and colleague at Gaia College, in 2010. Up until then I'd been operating Stewardship Natural Landscape Design, offering garden design and consultation as well as planting service and light garden maintenance since 2003. I still do the odd design and maintenance job, for fun and diversion. Together with teaching Gaia College courses in the fall and winter, this keeps me nicely busy. Though I had received a degree in landscape architecture and extensive industry training in Germany, I always felt that there was something important missing. I found the answer to that "something" upon moving to Victoria BC, joining SOUL, and meeting Heide and Michael Hermary. My approach to horticulture shifted completely towards organic principles. Looking back, I can say this has been a life changing development, not only professionally but personally. Finally a lot of things make a lot more sense...! 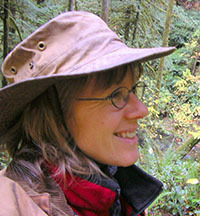 A graduate of Gaia College, I became a SOUL Certified Organic Land Care Professional in 2005 and soon after that, an instructor with Gaia College, first teaching the Ecological Landscape Design program, then the SOUL Organic Master Gardener course, and more recently the Plant Knowledge classes in Victoria. When I can spare some volunteer time, it goes toward SOUL, where I currently serve on the Board of Directors. I look forward to further broadening the mind by exchanging thoughts, knowledge, and experience with like-minded people. A "student of life" in times of considerable local and global challenges, I feel an strong dedication to living in harmony with each other and with the earth. My garden is home to many beautiful ornamental and food plants mixing and mingling happily, with a thick mulch layer covering the ground at all times. Puttering around the yard keeps me grounded, as does playing Sudoku, and listening to music from Renaissance to Pink Floyd. I enjoy Victoria's lively cultural scene, walking the beaches, practicing yoga, kayaking, and zooming around on my 250 Kawasaki Ninja!